The Political Environment: WI businessman had slammed Foxconn deal in 2017. And now, again. WI businessman had slammed Foxconn deal in 2017. And now, again. Bob Chernow warned against the Foxconn deal in 2017. In short we have a business, Foxconn Technologies, which is motivated by making money. On the other side, we have an ambitious elected official who is motivated to fulfill a promise to generate jobs so he can be re-elected. Foxconn will make the best deal possible by manipulating politicians who base their decision on hope and wishes. His views were ignored by politicians chasing after bumper-sticker slogans, self-serving sprawl development enrichment and new but unattainable job-creating promises to distract from earlier, failed pledges. Events over the past two weeks - - and additional in-depth, credible business media reporting - - have underscored Chernow's concerns which he has just reiterated and amplified. Foxconn needs to produce the most for the least in the fastest time for its customers. They apparently know what they are doing. But our naïve politicians do not. In fact, Fitzgerald and Vos were so anxious to shift the blame for this bad deal that they attacked recently elected Gov. Evers on rumors that Foxconn would change its plans. They would have been better off thinking about the future realities during early negotiations than now. Their short-term goals have made suckers of Wisconsin taxpayers. I have added this to the Foxconn archive I began when Walker first set the deal into motion 20 months ago. The documented archive is approaching 300 items. 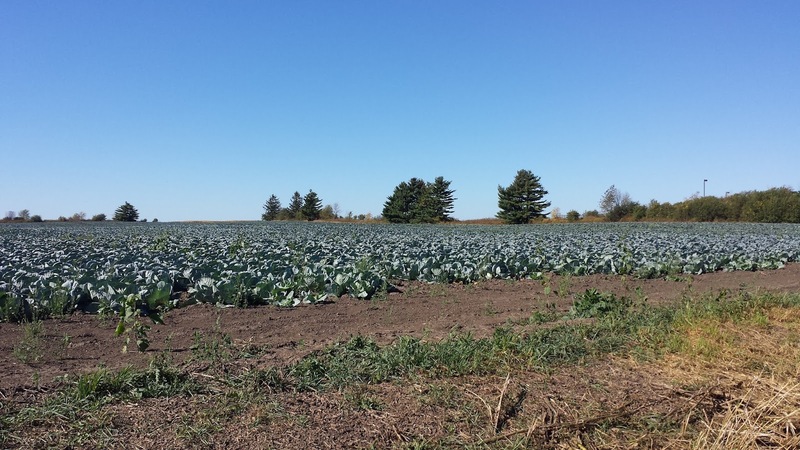 Thousands of acres like this cabbage field shown here in 2017 are now in an area designed 'blighted,' available to be seized by local government for Foxconn purposes. whose local officials who didn't have the foresight or wisdom to behave as leaders, not followers?